If you have a smart phone or tablet, I'm guessing that you know about Angry Birds. My kids (and I) have spent hours aiming those angry birds that the egg stealing pigs. Who would have thought such a concept would keep us entertained. This year Angry Birds isn't just limited to a digital game. Angry Birds Space can be played by everyone in this fun filled, action packed game. Here's the premise of the game. One player draws a space mission card which explains the structure to be created with the game pieces. The other players launch angry birds at the structure to knock down the pigs. Players score points based on how they knock down the structure and pigs. Included in the game are 2 Space Angry Birds, 3 pigs, 1 space helmet, structure pieces, 1 bird launcher, 32 space mission cards, and 8 points cards. This game is intended for 2-4 players. Becoming good at the game does take some precision. You need to become familiar with how the birds will fly from the slingshot as well as how to aim them at the target. Also, I would suggest a hard surface, like a table or hardwood floor, which makes the slingshot more stable. Building the structures are relatively easy for most kids, especially if they are familiar with other building toys. What I like about this game is that it makes kids see how angles and power from the slingshot react to the game. Players can't just randomly pull the slingshot back and hope that it will accomplish the mission. You have to think about trajectory. Granted kids aren't fully aware that they are learning these concepts, still it's a good foundation to lay. 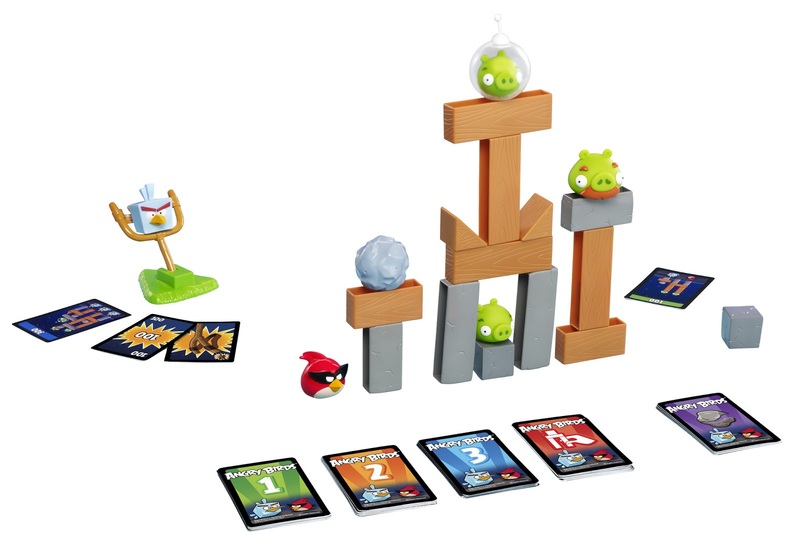 Angry Birds Space can be purchased at a variety of mass merchants and online. It retails for $16.99. Put down the smart phone this holiday season. Get out a game where you can make those angry birds take revenge on the pigs. Disclosure: I received this toy to review from Mattel. All opinions are my own. We have one of the Angry Bird's board games and it is a lot of fun. We might just have to check this one out. I got this for my son for Christmas, I'm sure he's going to love it! I have never tried anything to do with Angry Birds either. Sounds like something I will have to check out! Thanks for sharing this.